What are you guys playing this weekend? I’m playing a lot of Skyrim on the Switch. I’ve been leveling a warrior-type using 1h and block. Having not played Skyrim for years, I wasn’t aware of so many of the little changes. The biggest change is to Smithing. My goal was the level up Smithing and craft some pretty epic items. Turns out, it’s a little more difficult now. 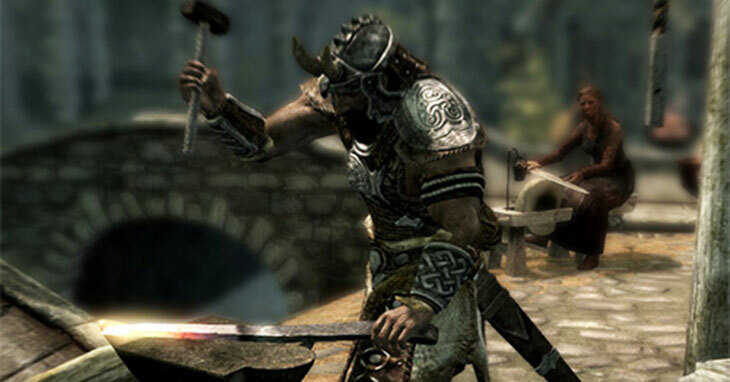 Smithing in Skyrim now works off the value of the item. From what I read, the best ratio of resources to skill gains comes from making ‘gold rings’, but I’m also reading some info about Dwarven Smithing. Looking for some advice here. Are any of you out there Skyrim savants with some advice on how to level Smithing and Enchanting? There are many “guides” out there that simply outline exploiting. I don’t want to exploit. I want to play the game legit, but I want to reduce the friction and grind involved. Also looking for a bit of input on Heavy armor. Which path (left or right) do you guys recommend? Leaning towards the one that reduces weight, but otherwise not a lot of value there. My ultimate goal is to be an awesome shield bashing and slashing warrior guy who can just charge in and smack people around — even bashing dragons sounds fun. Input welcome! That’s enough of my Skyrim noobness. What have you guys been up to this weekend? Previous PostWhen is The Elder Scrolls 6 Coming Out? Next PostWhat Did You Play This Weekend? Working and playing WoW. It’s alt season…lvling prof’s and getting cosmetics and fishing and mounts/pets/toys and all of the fun little stuff that game does well esp. for gamers with no time! It’s maddening getting older sometimes! That is so the truth. As I’ve gotten older almost everything in life has become better EXCEPT for my free time. It’s maddening for sure. … this method cost a lot of money!!! i do not really understand your question about the rigtside/leftside thingie… right side is heavy armor, left side is light armor. so it comes down to what you want to wear. Going left on the skill tree gives Fists of Steel (sucky) > Cushioned (reduced falll damage, meh) > Conditioning (no weight for heavy – oooOooo). Going right gives: Well-Fitted > Tower of Strength > Matching Set > Reflect Blows. All decent. Going right is a clear choice, I think, but that conditioning is really so tempting. I use Heavy because I think it looks way cooler for a fighter type. Also, they patched the game so making daggers doesn’t work anymore.